Jin Ping Mei (金瓶梅, literally "The Plum in the Golden Vase", also translated as "The Golden Lotus") is sometimes considered to be the fifth classical novel after the Four Chinese Classical Novels. It is the first full-length Chinese fictional work to depict sexuality in a graphically explicit manner, and as such has a notoriety in China akin to Lady Chatterley's Lover in English. The novel describes in detail the downfall of the Ximen household during the years 1111-1127 (during the Southern Song dynasty). The story centres around Ximen Qing, a social climber and lustful merchant whose wealth allows him a consort of wives and concubines. A key episode of the novel, the seduction of the lascivious, adulterous Pan Jinlian, occurs early in the book and is taken from an episode from Water Margin. After secretly murdering the husband of Pan, Ximen Qing marries her as one of his wives. The story follows the domestic sexual struggles of the women within his clan as they clamour for prestige and influence while the Ximen clan gradually declines in power. What happens when a daughter says that her father was worse than Ximen Qing? This is year 2006, so the daughter does the obvious thing: she builds a website. Actually, she built two websites with that assertion. (Southern Weekend) The investigation of the daughter who reported her dad for keeping a mistress. By Dai Dunfeng (戴敦峰). June 29, 2006. The daughter denounced all the way up to the Central Disciplinary Committee about her father "keeping a mistress". She built her own website titled "My dad is worse than Ximen Qing." This caused her father to be aggrieved to want to sue his daughter in a court of law. This absurd story is enough to make people sigh. But did the father's actions constituted "keeping a mistress"? This reporter conducted an investigation but cannot come to a definitive conclusion. The reporter is perplexed by how an internal family conflict could evolve into a controversial public affair. Behind this story, apart from the conflict between law and feelings, we can see how traditional values, family attitudes and restless social emotions come into play with each other. Wang Jing played on the electronic keyboard while the cameras from three television stations recorded the scene. In the living room, her mother Yang Xili kept company with the reporters who did not get to join the interview. Periodically, she had to take interview calls from various media around the country. There was a case of carbonated soda on the floor to treat the reporters. It was almost empty. On June 23, Yang Xili's day was scheduled as follows: 7am CCTV interview; 9am Chongqing TV interview; afternoon Hunan Satellite TV interview, with outdoor scenes. In a well-thumbed notebook, Yang Xili has written down the contact information for each reporter who has requested an interview. On June 23, there are 23 media organizations in the book already. New names are being added every day. Wang Jing, a 19-year-old first-year university student, has been filing complaints about her father for the past three years -- an ordinary cadre in the National Land Resources Bureau, he is alleged to be "keeping a mistress." She has visited the Central Disciplinary Committee twice and she established a website titled "My dad is worse than Ximen Qing." In mid-June, the first media organization caught wind of this story. Then an internal family conflict became a public topic and the most controversial story at the major Internet portals. "This case includes all the elements that attract eyeballs: a government official, keeping mistress, female university student, filing complaints, the Central Disciplinary Committee ... " said a media worker. Wang Jing moved away from the electronic keyboard. This Yamaha electronic piano was purchased for her by her father in 1996 for 3,000 RMB. "I cannot imagine that he would become like this," said Wang Jing while tears welled at the corners of her eyes. On yesterday morning, her mother helding one hundred copies of "Legal Morning News" and distributed them outside her husband's office of the National Land Resources Bureau. The newspaper had published a news story about the case. Today, Yang Xili turned her attention to a Jinan newspaper which published an interview with Wang Jing's father Wang Zhihua. Yang Xili thinks that this newspaper has libeled and violated the rights of her and her daughter, and plans to sue the newspaper in court. Two hundreds kilometers away in Linyi, Shandong, Wang Jing's father Wang Zhihua is suffering a fate in which he is better off dead than alive. "I wanted to die several times. But if I am dead, I can't explain things," said Wang Zhihua to the interviewing media as tears rolled in his eyes. It took less than one year to destroy this perfect family. The year was 2003. In 1998, the father left the military for a new job. Previously, although Wang Jing spent more time with her mother, she was even closer to her father. "In my eyes, my father was like Shi Guangrong in the movie 'The Years of Burning Emotions.'" Her father was a military man, and this made Wang Jing proud among her schoolmates. In Wang Jing's memory, her parents had never quarreled before she entered high school. "Each weekend morning, I woke up and crawled into their bed between them and the three of us would chat." But from 2003 on, those beautiful memories no longer continued. First, her father became dissatisfied with her mother's cooking. He often argued with her mother about the flavor. "My father did not say anything when he came home. He just ate and then he got into bed to read and sleep." Then her father began coming home later and later -- 10pm, 11pm, midnight and eventually he did not come back all night. His father said that he was working overtime at the office on paperwork. "I'm going to divorce your mother." The father told Wang Jing suddenly after they finished lunch and were ready to take a nap. This was like a lightning bolt out of a clear sky and it stunned Wang Jing. "Why? Why?" "Your mother treats my parents poorly and I cannot tolerate it anymore," said her father. "You speak to your mother. We can get a quiet divorce. If we get along for the next couple of years, we can reconcile. Or else I move out now and then get a divorce after two years of separation. If she is unwilling, I will have to petition the court for a divorce." Yang Xili has a heart condition. When she heard Wang Jing relate what happened, she fell ill and the heart medicine was no help. She had to go to the hospital and get some intravenous drips before she recovered. Yang Xili told her daughter that neighbors have told her that Wang Zhihua has been seen in the area on nights when he did not return home. So Yang Xili began to follow him and found that he was "moving around in circles and following unusual routes." On October 24, Yang Xili stopped Wang Zhihua at the number 15 building next door. There was a 40-year-old woman with him. Through the real estate agency, Yang Xili learned that Wang Zhihua had rented that apartment for 450 RMB per month paid for by him. Prior to that, Wang Zhihua and that woman had lived in room 101 of their building for six months. Wang Jing confronted her father. Her father told her that the women is his cousin named Li Cuilian, who had brought his uncle to get medical treatment in Jinan. Therefore, he arranged for her to stay downstairs. Yang Xili then took Wang Zhihua's photograph to ask the building manager at number 15. The man said that he recognized the person: "He said that his name is Li and he is a business man." "If she was a relative, then why not bring her to stay at our home? Why would he be with a relative?" When Yang Xili spoke about these past histories, her eyes became red on the rim. Although Wang Jing has never seen Li Cuilian, she determined from her mother's description and various other clues, that "her father must have an improper relationship with this Li Cuilian." That was the woman who destroyed her wonderful family. "I trust my mother and I trust my judgment." That year, Wang Jing was 16 years old. 16-year-old Wang Jing decided to "save" her father and to save this almost broken family. For three months, she mostly did not attend class and went to her father's office to persuade him to change his mind. "How did your mother know so much? Did she hire an investigative agency?" What Wang Zhihua said only reaffirmed Wang Jing's judgment: her dad must be keeping a mistress. Wang Zhihua insisted from the start that he did not have any unusual relationship with Li Cuilian: "Don't listen to your mom" and then it was silence, silence, silence. Wang Jing often lied in bed and thought for hours: for a man, his profession and family should be the most important things, but how would her father abandon his wife and daughter without remorse for another woman? The more puzzling thing was that this woman was neither young nor pretty. She is a 40-something-year-old peasant woman with two children. What was it about her that attracted her father? "I learned from the family that Li Cuilian came from Heze village. When they were young, they were engaged to each other. But that ended when Wang Zhihua left the village to join the military." Li Cuilian's husband Niu Huimin confirmed: "From March to October 2003, she was in Jinan although she did not admit that and said instead that she was in Nanjing instead." After Yang Xili called Niu Huimin, Li Cuilian admitted that "she stayed at Wang Zhihua's place but she did not have a relationship with Wang Zhihua." Niu Huimin has also written complaints about Wang Zhihua's keeping a mistress and posted them in front of the National Land Resources Bureau. When interviewed by this reporter, Niu Huimin admitted that "there is no proof to show that Wang Zhihua had kept Li Cuilian as a mistress." Wang Jing could not persuade her father, who turned it around to ask her to persuade her mother to get an early divorce. In early 2004, Wang Jing went to the Shandong province National Land Resources Bureau to complain about her father. On August 31, one day before school started, Wang Jing wrote a letter to the Central Disciplinary Committee to ask for help to discipline her father and save her family. At the end of 2004, the National Land Resources Bureau informed Wang Jing and her mother about the result of the investigation: there is no evidence that he kept a mistress. "The provincial bureau leaders paid attention to his matter and sent in special people to investigate. They even went to Wang Zhihua's old home in Heze city Dingtao county to understand the situation," said Shandong province National Land Resources Bureau disciplinary director Xu Jialin to our reporter. "The investigation found that Li Cuilian's mother is really the aunt of Wang Zhihua. In 2003, Li's father had a complicated renal condition and was treated at Jinan's Qilu hospital. Li Cuilian traveled to Jinan to look after her father." "The results of the investigation were sent to the provincial disciplinary committee, and they think that the results are quite obvious." Xu Jialin said, "There is no reason for us to shield an ordinary division director such as Wang Zhihua." A leader in charge of disciplinary issues at the provincial National Land Resources Bureau thumped his chest and said: "I guarantee with my party membership and official title that Wang Zhihua did not keep a mistress. The Central Disciplinary Committee wanted to investigate this case, and the provincial disciplinary committee called me to their office. We checked over and over again. Wang Zhihua did not have the time or money to keep a mistress." This official who did not want his name in the press said: "Is there any reason for us to fight the pressure of the Central Disciplinary Committee for the sake of Wang Zhihua?" Wang Jing and her mother could not accept the results of the investigation by the National Land Resources Bureau. "Why did they only check the information with Wang Zhihua and Li Cuilian? Why didn't they check with the mother and daughter as well as the neighbors?" Xu Jialin explained, "The mother and daughter complained about Wang Zhihua and they provided the written materials to us. So we actually already know about their situation." In June 2005, on the day after completing her university entrance exams, Wang Jing went to the Central Disciplinary Committee and turned in the materials at the petitioner reception office about Wang Zhihua's keeping a mistress. This was her first long trip away from home, and so her mother accompanied her to Beijing. "A lady wearing a number 115 tag received us and took over our complaint materials. She said that she will ask the Shandong provincial disciplinary committee to work on it." Just after the Chinese New Year in 2006, Wang Jing went to the Central Disciplinary Committee to complain about her father again. In the complaint, Wang Jing strongly demanded that the Central Disciplinary Committee follow articles 150, 152 and 154 in the "Chinese Communist Party Disciplinary Punishment Regulations" to investigate her father and expel him from the party. "But the attitude of the number 115 worker in the petitioner reception office had turned 180 degrees around." Wang said, "She told me that the case has been investigated and there was no such thing. She told me to return home quickly." On October 28, 2005, the court granted a divorce between Wang Zhihua and Yang Xili on the grounds of irreconcilable differences. "Since I have nobody to petition any more and I could not appeal via emotion, I use another method to let society know the truth." After returning from her second visit to the Central Disciplinary Committee, Wang Jing decided to set up an "anti-mistress" website and posted all the materials about her father on the website. 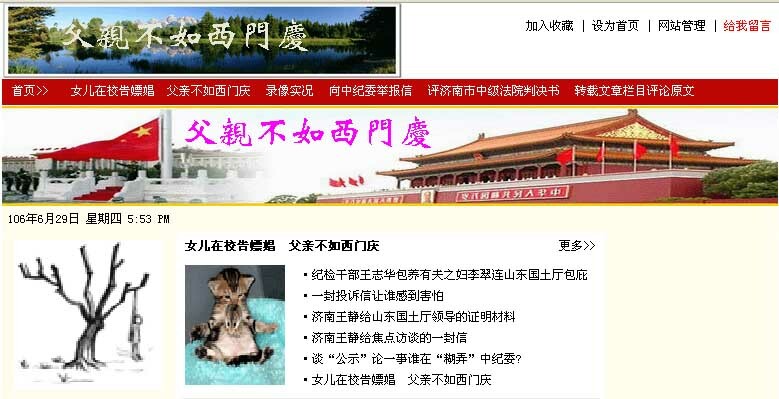 The title of the website is "My father is worse than Ximen Qing." "People think that I am out to get him, but this is not how I feel. I am trying to save him." Wang Jing is firm on this point, "I hope that through public discussion, more people will know about this and get the authorities to stop him and prevent similar things from happening." Wang Jing used 4,000 RMB and 1,000 RMB per year to rent two web spaces and set up two different websites under the same title which are updated simultaneously. The money for renting the web spaces was "earned from selling cosmetic products on weekends." Why did the website have such a name? In Wang Jing's view, Ximen Qing is a famous person in Shandong and her father was "even worse than Ximen Qing." "Before my university examination, I called his mobile phone for half an hour and he would not pick up." When Wang Jing remembered that, she started sobbing, "I was hoping to hear his voice and I was hoping that he would give me some strength, but he refused." "He forced me down this path. In my first year in high school, I thought about how wonderful life was going to be. I would get into a good university, do some buying and selling on the Internet. When I graduate, I may open a restaurant," said Wang Jing. "Now all that is in ruins." Wang Zhihua has not been having a good time. A private family matter has become public discussion for two years and everybody knows about it. At the end of 2005, he asked to be transferred to Linyi. But he still felt the new colleagues were "gossiping about him, wanting to ask but not daring to ask." Over the past three years, Wang Zhihua has declined to be interviewed by the media. This reporter called Wang Zhihua's mobile phone number as provided by Yang Xili. A middle-aged male answered but he denied that he was Wang Zhihua. On June 21, Wang Zhihua was finally unavoidably cornered in his office by a Shandong media organization: "Ultimately, she is my daughter and we are related by blood. Other people can misunderstand me, but my daughter is still young and being misled by others. Someday, she will grow up and become an adult. When that time comes and everybody is still talking about her complaints against her father, what kind of impact will it have on her?" This 45-year-old man is already "white-haired and shriveled up." Faced with the step-by-step pressure from her daughter, Wang Zhihua was "quite heart-broken." "My daughter cut off our blood ties personally. It can be said that I am better off dead than alive." He claims that he is contacting a lawyer for the purpose of suing his daughter. Wang Jing's websites have been active for less than half a year and it has more than 200,000 visits. The poll that Wang Jing put on the front page showed almost 200,000 votes, of which 49.49% thinks that "Wang Zhihua should be expelled from the Party," 39.39% "completely support" Wang Jing, 9.9% "support" her and only 0.19% "do not support" her. It is not known whether Wang Jing is happy with these results. But more and more netizens are leaving comments to say that they think Wang Jing is "overreacting," that she should not interfere with her parents' emotional problems and that Wang Zhihua's actions did not constitute "keeping a mistress." "Every person has his/her own way of looking at this matter. I can understand that." Wang Jing is very tolerant, and she does not delete critical comments about her on the websites. Wang Jing has just gone on summer vacation from school and she has updated her website with a photograph of a painting of Ximen Qing by Dai Dunbang. 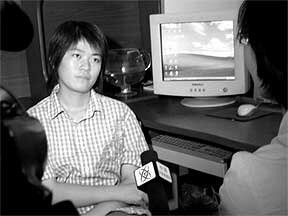 After taking her last examination in Computer Science on June 25, Wang Jing has been interviewed non-stop by the media. More and more people are learning about the grievances between father and daughter through newspapers, television or Internet. "What would I do if I judged wrongly? I have never thought about this question." After a pause, she said slowly word by word, "If I am really wrong, then I will pay him back with the rest of my life."